Bajaj Avenger has the unique distinction of being the only cruiser bike available in India before the launching of Harley Davidson bikes in this country. The bike has been keenly followed by bike enthusiasts who would like classic things. Bajaj Avenger is available in four sizzling colours – Midnight Black, Mist Grey Silver, Cocktail Wine Red and Plasma Blue. The classic look of the bike is enhanced by a large transparent windshield and long handle bars. The round headlamp, round shaped bright yellow colored turn indicators, rear view mirrors and large fuel tank are eye catching. The front tyre is covered with a long body colour fender whereas the tail of the fender is black plastic material. The bike is decorated with stickers which give it a cool look. Big brake light and round shaped turn indicators are awesome. 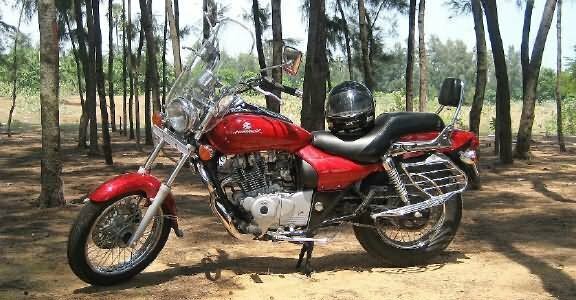 Bajaj Avenger is a very comfortable bike. The seating arrangement for the rider is very comfortable. The passenger seat is step-up. A long backrest and grab bars are provided. Large windshield adds to the comfort of the rider. Other comfort features include Analogue Fuel Guage, Analogue Tacho Meter, Analogue -1 Trip Meter, Analogue Speedometer, Passenger Footrest, Passenger Backrest and Pass Light. Bajaj Avenger has advanced safety features. The bike is equipped with front disc brake (Hydraulically-Operated Disc Brake – 260 mm) and rear drum type brake. Wider tyres and wider wheelbase give stability and firmness to the bike on road. The front suspension comprises of Telescopic forks, 140 mm travel while the rear suspension comprises of Triple rate spring, 5 way adjustable, hydraulic shock absorbers. Bajaj Avenger has 198.8 cc, 4 stroke, DTSi, Oil Cooled engine which produces a maximum power of 17.51 PS at 8000 rpm and a maximum torque of 16.78 Nm at 6000 rpm. The bike sports five speed gearbox. The price of Bajaj Avenger is Rs. 69000 (taking Delhi as base price location). However, the price specified is indicative price only and reflects lowest approximate price which excludes tax, registration, insurance and cost of accessories.